We met Maya, a 19-year-old student who caught our attention on the Harajuku street with her all black street style. Maya is wearing an M.Y.O.B long sleeved silk shirt, which she cinched with a black corset from Nadia, and paired with high-waisted short shorts from American Apparel. Thigh high socks, Demonia platform lace-up booties, a printed bowler sling bag from MCM, and accessories such as M.Y.O.B hoop earrings, a leather belt choker, and silver rings from Kenzo completed her chic ensemble. 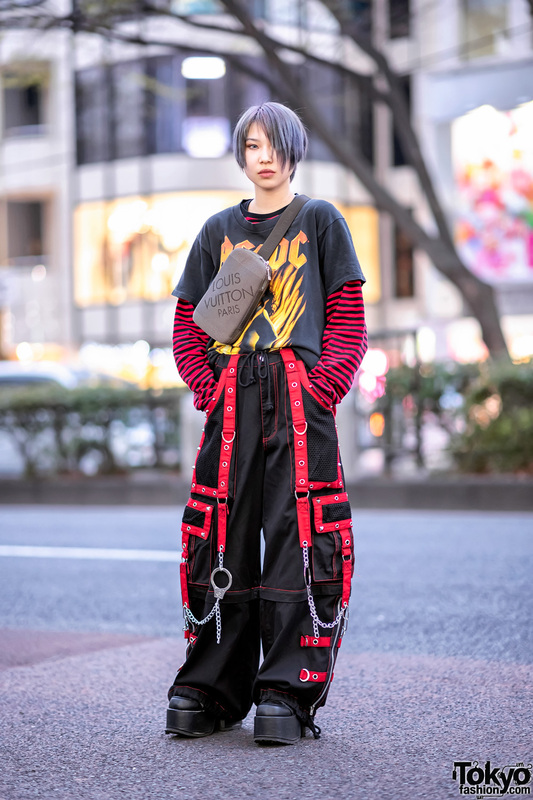 Japanese streetwear brand, M.Y.O.B is Maya’s fashion favorite, and she listens to the music of Monsta X. Follow Maya on Instagram.